From about 1830 to 1849, Bent's Old Fort, located in present-day Colorado on the Mountain Branch of the Santa Fe Trail, was the largest trading post in the Southwest and the mountain-plains region. Although the raw enterprise and improvisation that characterized the American westward movement seem to have little to do with ritual, Douglas Comer argues that the fort grew and prospered because of ritual and that ritual shaped the subsequent history of the region to an astonishing extent. At Bent's Old Fort, rituals of trade, feasting, gaming, marriage, secret societies, and war, as well as the "calcified ritual" provided by the fort itself, brought together and restructured Anglo, Hispanic, and American Indian cultures. Comer sheds new light on this heretofore poorly understood period in American history, building at the same time a powerfully convincing case to demonstrate that the human world is made through ritual. Comer gives his narrative an anthropological and philosophical framework; the events at Bent's Old Fort provide a compelling example not only of "world formation" but of a world's tragic collapse, culminating in the Sand Creek massacre. 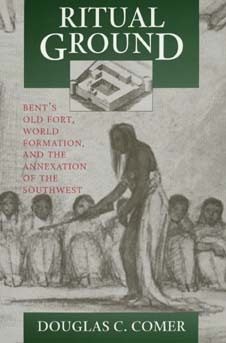 He also calls attention to the reconstructed Bent's Old Fort on the site of the original. Here visitors reenact history, staff work out personal identities, and groups lobby for special versions of history by ritual recasting of the past as the present. Douglas C. Comer serves the U.S. National Park Service as Manager of the Applied Archaeology Center at Silver Springs, Maryland.